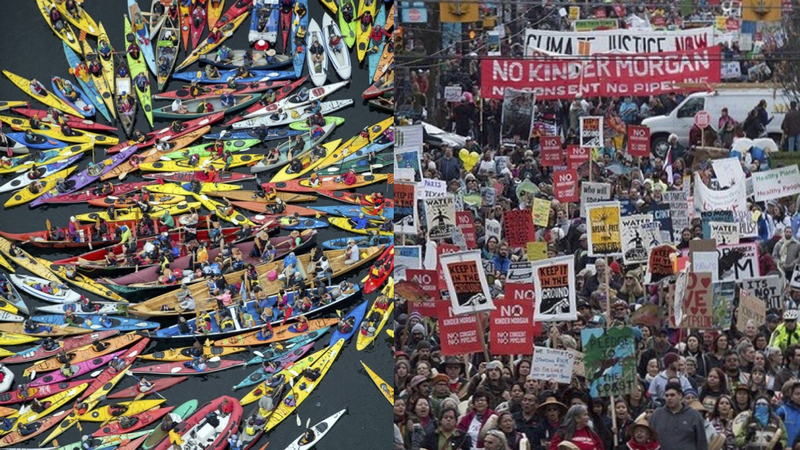 Join us for a day of mass action by land and sea on May 20 to protect our waters, our communities, and our climate from Kinder Morgan. The Trans Mountain pipeline expansion threatens to increase the transport of toxic tar sands oil through Washington waters by 700%, while trampling indigenous rights and destabilizing our global climate. We need to act now! Kinder Morgan has until May 31 to decide the fate of this pipeline. First Nations-led resistance has already pushed them to the brink. Now is our chance to spread the resistance into Washington state. Together, we will stop this pipeline as one Salish Sea, because solidarity knows no borders! Rally is happening from 10 to 11:30 a.m.
March to waterfront to meet flotilla (approx.1.5 mi) from 11:30-12:30 p.m.
Meet at Seacrest Park, Cove 2 -- the grassy area just south of Alki Kayak Tours (Address: 1660 Harbor Ave, SW). Look for the check-in table. Start time: Check-in opens at 9 a.m. Be ready for 30 min paddle to and from destination, and 3+ hours on the water. Launch + paddle from 11 a.m.-12 p.m. Renting kayak/gear: We cannot guarantee there will be a rental kayak for everyone who wants one, but we are working to get as many people out on the water as possible! It will be really close and we are confident most people who want to be out on the water will be. We are asking for a donation on a sliding scale, from $5 to $30. Please contribute what you are able. No one will be turned away due to lack of funds. Look out for an email or phone call to confirm your space in a kayak in the next 24 hours. Clothing: Wear layers, NO COTTON, bring water, snacks, sunscreen. Parking: Parking for unloading is very limited as well as day parking. There will be traffic the morning of for unrelated events, too. So, it would be best to get there early and we recommend carpooling if possible! Bring others: This is a family friendly event and the more the merrier! Feel free to bring friends. RSVP for this day of action and share with your friends to keep the momentum going.